Welcome to the SpringHill Suites Pittsburgh Latrobe where you will have a legendary experience, offering a refreshing stay unlike any other. 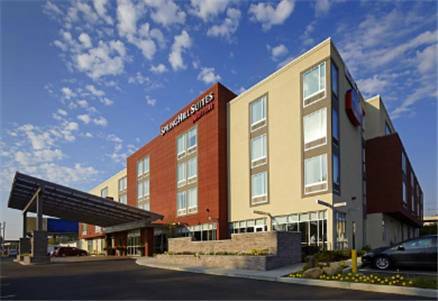 Our Pittsburgh-Latrobe area hotel is situated in the beautiful Laurel Highlands, less than one mile from Arnold Palmer's Latrobe Country Club, near area attractions such as Idlewild & SoakZone, Saint Vincent College and Pittsburgh Steelers Training Camp. As a guest, you'll have the opportunity to enhance your stay by adding a golf or corporate meeting package at nearby Arnold Palmer's Latrobe Country Club. You can expect bright, comfortable suites with a separate living area, including mini-fridge and microwave at this Latrobe, PA hotel. Our stylish design offers a revitalizing stay with amenities such as Free Wi-Fi, and flat screen TVs with cable. Start your day right with our complimentary hot breakfast buffet. Our networking area and cocktail lounge is perfect for staying productive or catching up with friends.